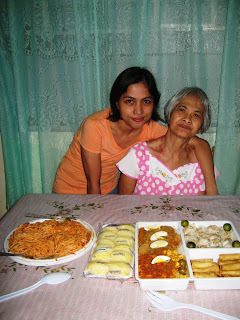 That is my maternal grandmother's age when she celebrated her birthday last October 30. Hubby and I went there for the occasion and also to make the most of the long weekend. We didn't have a lot of food since we don't have guests. Just a small celebration to put a smile on her face. many more birthday to come for us to celebrate! Oh 73 years old? She looks so young and energetic still! Eldest first grandchild huh? I am the youngest grandchild :P. Not sure if I am the last... I never met my grandparents. Else my grandparents would of spoilt me bad hehee. sarap ng handa...nagutom tuloy ako.